As reported by BBC this may lead to new avenues of exploration to get around the immunosuppresant problem of transferring insulin producing cells from one person to another. A mother's cells may try to repair the tissue damage in an unborn child that can result in type 1 diabetes, research suggests. US and UK researchers found unusually high levels of maternal DNA in children with type 1 diabetes - an indication of cell transfer from the mother. They also found these cells could go on to produce insulin, the hormone lacking in type 1 diabetes. The study is published in Proceedings of the National Academy of Sciences. It raises hopes of new treatments for the condition. It has been known for some years that mother and baby exchange stem cells in the course of pregnancy, and that these may live on for many years, apparently tolerated by the new host. The phenomenon is known as microchimerism - and it is still unclear as to whether the presence of such cells can be harmful to the recipient. The researchers, from the University of Bristol and Seattle's Fred Hutchinson Cancer Research Center, found around 20% of children with type 1 diabetes had unusually high levels of maternal DNA in their blood. They also found some maternal cells had entered the child's pancreas and were functioning there as insulin-producing beta cells. The study found no evidence that the mother's cells were attacking the child's insulin cells and no evidence that the maternal cells were targets of an immune response from the child's immune system. 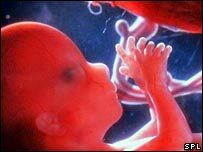 Researcher Professor Edwin Gale said: "Our initial theory was that perhaps, in some situations, too many cells cross from mother to foetus in pregnancy. "Could diabetes result because the child lost tolerance to those cells because they are genetically half foreign? "Our research appears to disprove this. It is possible that the maternal cells may even be helping to regenerate damaged tissue in the pancreas." Dr Lee Nelson, who also worked on the study, said the findings raised the possibility that a mother's stem cells might be harvested, and used to treat her diabetic child. In theory, these cells would be of more use than those taken from an unrelated donor, which would be completely genetically mismatched. Dr Nelson said: "The child is probably tolerant to the mother's half-matched cells because the child acquired the cells during its life as a foetus while its immune system was still developing." Jo Brodie, of the charity Diabetes UK, said scientists trying to perfect islet cell transplantation as a treatment for diabetes faced problems sourcing enough material, and preventing the recipients' immune systems from attacking the newly transplanted cells. "If cells with the potential to produce insulin can pass from mother to child during pregnancy, without the child's immune system destroying them as seems to be the case here, then this could open up promising new avenues of research, and perhaps provide a new source of insulin-producing cells for therapeutic use." Around 350,000 people in the UK suffer from type 1 diabetes and have to give themselves regular insulin injections.